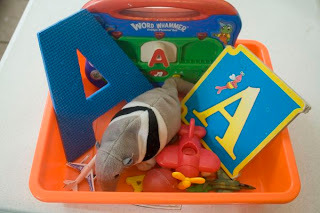 This week we are talking about the letter A. The girls already know the letter A and the sounds it makes, but we did more practice on writing and talked about some jobs that start with the letter A. Even though Eli is pretty young, I made him a letter A sensory bin. I put a few foam A's of various sizes, a magnet with the letter A that says the sounds A makes, a book about the letter A, and several objects that start with the letter A. I had the girls help collect the objects; we found airplanes, an apple, an anteater, and an alligator. 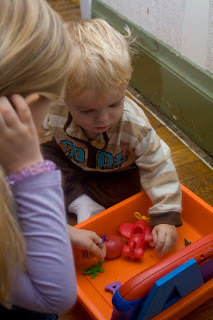 Bria helped show him all the stuff in it; she really enjoys teaching.